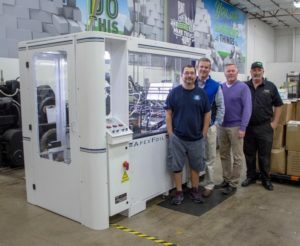 St. Croix Falls, WI November 8, 2018 – Slate Group, a national commercial printer out of Lubbock, TX, has greatly expanded their in-house capabilities to include Foil Stamping and Embossing by installing Kluge’s ApexFoil machine. Although the key properties of foil stamping are easy to identify – Time, Temperature, and Tonnage (3-T’s) – they have often been difficult to measure and control. Operators at Slate Group can use the ApexFoil’s Compass™ control system that includes patented features to control the 3-T’s. Compass allows operators to greatly reduce, and in some cases, eliminate make-ready on every job. You can visit Slate Group at https://www.slategroup.com/.